Together, Jason and Medea offer wide area survey capabilities with Jason as a precision multi-sensory imaging and sampling platform. Both Medea and Jason are designed to operate to a maximum depth of 6,500 meters (21,385 feet), are transportable, and can be operated from a variety of vessels. The current Jason ROV has conducted over 745 dives and the longest dive to date has exceeded 115 hours. Medea is connected to the surface ship by a 0.68 inch armored cable with three fibers and three electrical conductors. Jason is connected to Medea by a neutrally buoyant tether that is 2.1 centimeters (0.84 inch) in diameter and approximately 50 meters (164 feet) long. Jason is designed for detailed survey and sampling tasks that require a high degree of maneuverability. It weighs 4,082 kilograms (9,000 pounds) in air but is neutrally buoyant at depth. Jason’s closed-loop controlled dynamic positioning abilities make it a very maneuverable and stable platform. Both Medea and Jason have been de- signed to be superior real time optical imaging platforms with high quality cameras and lighting. The vehicles work together to provide lighting for each other in a fashion not commonly available in other submersible systems. Medea is configured with three cameras for tether management and terrain identification and visual location of Jason when both are operating. In single body mode, Jason is attached directly to the main armored cable which is a larger diameter (.842”) cable specifically designed to allow for heavy lifting operations. Syntactic foam floats are installed during launch onto the main cable to float a section of cable close to the vehicle and maintain a catanary. The cable comes off the direct drive heave compensated winch and is fairlead through a new larger knuckle boom overboarding crane. There are two tool sleds that can be used with the single body system. One is the science sled that has two hydraulically actuated swing arms and a large front basket. It also has a rear science bay that can accommodate large science sampling systems. The second sled is the heavy lift sled. This sled adds significant capabilities to Jason including heavy lift operations of up to 4,000 lbs using either the bottom mounted hydraulic latches or the bottom mounted heavy lift winch. These capabilities are essential to carrying out increasingly common tasks such as observatory installation and maintence as well as large mooring deployments and cable laying. 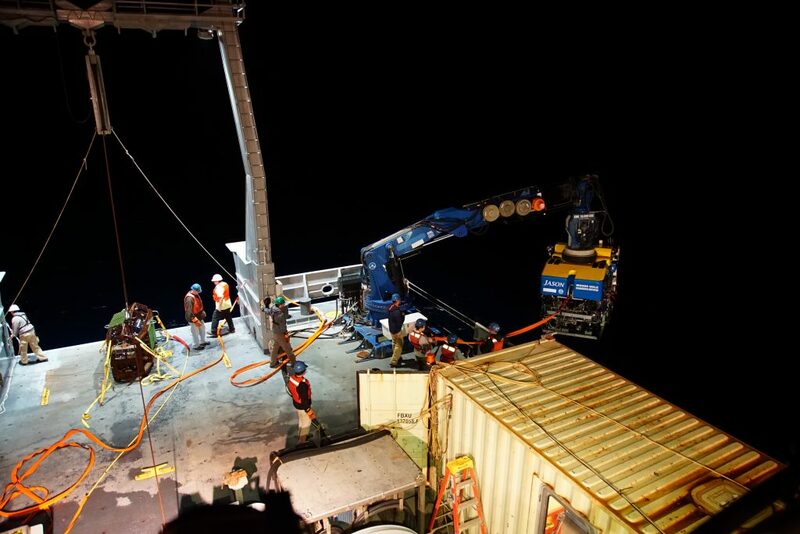 Single Body mode also allows for use of the under vehicle elevator which can carry large quantities of samples and equipment to and from the seafloor. The Control Vans accommodate the operator positions (pilot, engineer and navigator) and stations for the scientific watch leader, event logger and data/video recorder plus auxiliary stations for 1 or 2 additional observers. Thus, a full complement of up to 5 scientists can be comfortably accommodated in the vans at any one time. There is also a remote viewing station, with comms to the van, that can be set up elsewhere aboard ship. The Jason/Medea system can be operated from a variety of support vessels. The support vessel must have a dynamic positioning (DP) system and sufficient deck space and displacement to accommodate the Jason winch system, launch and recovery system, control vans, tool van and equipment storage van. Most of the larger UNOLS ships work well and are preferred as Jason support vessels.